Will the Eastside get a chance to sound off on helicopter noise? The skies above the Eastside are frequently filled with the drone and buzzing of helicopters. 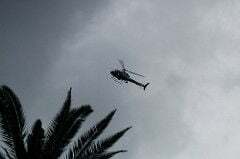 LAPD choppers hover for hours during evening searches. Media helicopters awaken residents as news crews try to capture images for early morning news casts. Conversations on the street stop as helicopters land atop a rooftop heliport in Echo Park. In response to complaints, a public hearing organized by Congressman Howard Berman will be held tonight to allow residents from across Los Angeles County t0 tell the Federal Aviation Agency how helicopter noise is affecting their neighborhoods. But that public hearing is being held in Sherman Oaks, and no other meetings are planned, according to an official with Berman’s office. “This is basically the sole forum for community input,” said an official with Berman’s office of tonight’s meeting in the Valley. Berman introduced legislation last year to force the FAA to restrict flight paths and establish minimum altitudes to shield residential neighborhoods from low-flying helicopters (the legislation does not apply to police or other emergency aircraft). Earlier this year, Berman and several other Los Angeles congressional representatives asked the FAA to work with residents to help reduce helicopter noise across the county. That’s how tonight’s meeting came about. “We are going to listen … and work with the communities and helicopter operators to try and address the concerns without compromising safety,” said FAA spokesman Ian Gregor. While Berman’s office has said no further public hearings will be held, Rep. Adam Schiff, whose district includes a slice of Loz Feliz and is one of the sponsors of Berman’s Los Angeles Helicopter Noise Relief Act, is looking at holding another meeting in his district and closer to Eastside residents “to address the very real concerns raised by residents,” according the congressman’s office. Tonight’s public hearing is scheduled to take place from 6:30 p.m to 8:30 p.m. at Burrill Hall at Millikan Middle School, 5041 Sunnyslope Ave. in Sherman Oaks.